GEETA ARYA teaches History at Zakir Husain College, Delhi University. SHAILAJA BAJPAI is a media critic with the Indian Express, New Delhi. RAKESH BATABYAL is a researcher in history and ethics. He is currently working on the resources of responsibility in contemporary India. MALABIKA BHATTACHARYA teaches Spanish at the School of Foreign Languages, Government of India, and writes on Hispanic Literature. PAMELA CONSTABLE is the South Asia Bureau Chief for the Washington Post. WILLIAM DALRYMPLE is the author of City of Djinns and At the Court of the Fish-eyed Goddess. He is currently working on The White Moghuls, a book detailing the life and times of James Achilles Kirkpatrick, which will be published by HarperCollins next year. A. K. DAMODARAN was a member of the Indian Foreign Service. He held several important assignments in Bonn, Moscow, Beijing and Rome where he was Ambassador. He was also Head of the Policy Planning Division of the Ministry of External Affairs. KANIKA DATTA is Associate Editor at Business Standard, New Delhi. INDRAJIT HAZRA is a journalist at The Hindustan Times, New Delhi. AMITAVA KUMAR is the author of Passport Photos, to be published in May from the University of California Press. G. K. LIETEN teaches at the Amsterdam School of Social Science Research, University of Amsterdam. 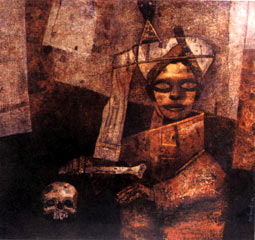 MANJULA PADMANABHAN is a writer and artist living in New Delhi. MADHAVAN K. PALAT is Professor at the Centre for Historical Studies, Jawaharlal Nehru University, New Delhi. IRA PANDE is Senior Editor at Dorling Kindersley, New Delhi. GIULIO SCHIAVONI teaches German Language and Literature at the University of Vercelli, Italy. RANJANA SENGUPTA has worked as a journalist and is presently writing a biography of Delhi. SHUDDHABRATA SENGUPTA is a documentary film-maker with the Raqs Collective and a freelance writer based in New Delhi. SHIV KUMAR SRINIVASAN teaches at the Department of Humanities and Social Sciences, Indian Institute of Technology, New Delhi. TRISTRAM STUART is a freelance writer based in New Delhi. ACHIN VANAIK recently co-authored South Asia on a Short Fuse: Nuclear Politics and the Future of Global Disarmament. KUNAL VERMA is a film-maker specialising in wildlife and national security issues. SHELLEY WALIA is Associate Professor of English at Panjab University, Chandigarh. PETER WATERMAN is author of Globalisation, Social Movements and the New Internationalisms (Cassell, London, 1998) and co-editor of Labour Worldwide in the Era of Globalisation: Alternative Union Models in the New World Order (Macmillan, London, 1999). This site is best viewed in I.E 5.0, Netscape 4.51 or later at a resolution of 800x600 pixels.